As promised I’ve worked out my February goals. Yesterday, I spent some time thinking more about my goal-setting (why I stopped, how to make it better), and I’ve come to a couple conclusions. So what does this mean for my February (and future) goals? First, I’m keeping it simple. I’m going to have 5 goals for February (though one of those five does have “mini-goals”). Second, most of them directly correlate with and help me achieve items on my 10 in 2010 list. So without further ado…my February goals. 5lbs lost. – I want to finally reach my goal weight of 135lbs. (This is really still flexible for me. I’m not sure what my ideal weight is, but this seemed like a good starting point.) Ideally I’d like to do it by June so that I’ve lost all my weight prior to ordering my bridesmaid dress for my brother’s wedding. I don’t want to worry about losing weight once it’s been ordered and having to have additional alterations made. This means I need to lose 5 – 6 pounds a month. This is totally doable; I just need to frickin’ focus already! Track daily – I’ve been really terrible about tracking my food lately. I’m not even talking calorie counting (though that is my actual goal); I’ve been bad just documenting what I’m eating. How many foodie posts have you seen around herelately? Exactly my point. Obviously this is going to help me achieve the reaching my goal weight goal. Obviously, this is the goal with mini-goals. 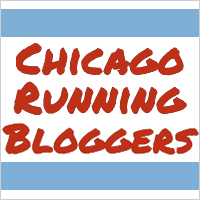 I found a sprint distance triathlon on June 27th that I would like to do. Final details don’t become available until March (I believe it’s a small park district run event. ), but right now I’m planning to sign up. The mini-goals provide me a skeleton for triathlon training and will help me reach my 10 in 2010 goal of competing in a sprint distance triathlon. And of course, we all know cardio is good for us anyway. Strength training 3 days a week – This is the one goal that doesn’t directly correlate with any particular 10 in 2010 goal, but it’s one that will improve me over all. I always slack off when it comes to strength training. I need to work-out a more concrete plan, but I will make it happen. Create weekly meal plans and go grocery shopping weekly – Like tracking, this is something I used to be really good about doing and then it sort of fell by the wayside. Creating weekly meal plans will help keep me organized, help keep me on track to meeting my goal weight and properly fueling my body for my work-outs and triathlon training, and help me save money (10 in 2010 #10). So, in keeping with my goal to track everything. It’s time for today’s morning snackies and my lunch! My morning snack was two mandarin oranges. I took a photo, but it’s stuck in my iPhone right now. I’ll post that when I get home. Lunch was a new adventure. When I was at Jewel last night, they had a display of Kashi frozen entrees complete with coupons. 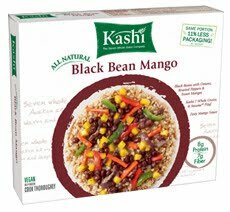 I’ve been wanting to try some of the Kashi frozen entrees. I don’t eat a whole lot of frozen meals, but I do think they’re nice to have on hand just in case. I grabbed the Black Bean Mango entree, and brought it for lunch today. Now, to be perfectly honest, I’ve yet to find a Kashi product I don’t like. There’s a few things I haven’t LOVED, but everything I’ve tried so far I’ve liked enough to finish eating. For example I wasn’t horribly impressed with the Dark Chocolate Coconut bars, but I liked them enough to finish the box. I really enjoyed this lunch. As far as frozen meals go, Kashi does a top-notch job. This tasted more like reheated leftovers than a frozen entree. I’d heard it was spicy so I was a bit scared (my spicy tolerance maxes out around mild salsa.) It wasn’t as bad as I expected at all. There was definitely a kick to it, but it was balanced out by the sweetness of the mango and the rice. It was also a perfect, filling portion. I ate it all without feeling stuffed or starved. Usually, I need to add something frozen entrees (e.g. Lean Cuisine), but this was plenty. It’s been nearly two hours and I’m still feeling satisfied. Overall, two thumbs up to Kashi on making a great frozen entry. I will definitely be keeping my eye our for coupons and sale so I can buy a couple more of these.